So through happenstance, I’m going to be seeing Phantom of the Opera approximately 8 times over the course of its 3 week run in my city. The Broadway obsessed teen who will always live inside me is over the moon. The adult me is slightly less enthused. That’s a LOT of ALW to sit through. 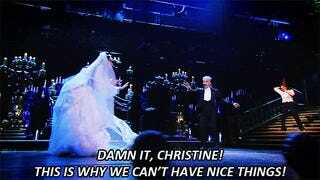 And the phantom in the context of the play is such a nice guy. The performance I saw last night had a pretty rapey final act. And I think Love Never Dies is a ALW’s better phantom-themed musical anyways. I also found out last night that my very first opera coach and director died yesterday, and I’m heartbroken. I hadn’t seen Alfred in many years, but we kept in touch via Facebook, and hes a treasured part of my collegiate memories. He’d find my phantom predicament hilarious.